* Include your phone and you might get a call from Mitch! 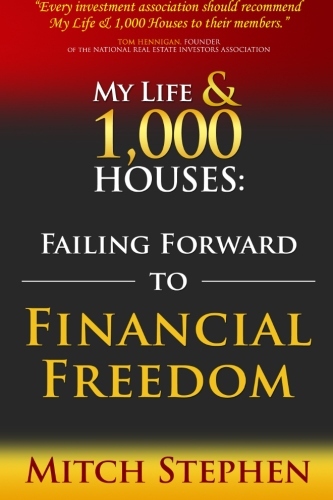 MY LIFE & 1,000 HOUSES: Failing Forward to Financial Freedom by Mitch Stephen is an exhilarating book of an amateur entrepreneur who stumbles upon the long standing revelations of business, money, love and life while struggling to find financial freedom. The journey eventually culminates into the purchase and sale of over 1,000 properties. "This is the story of a self-taught entrepreneur who amasses a lot of knowledge in real estate as he buys properties and eventually gets to over a thousand units. The author takes your through the highs and lows of the trade while pointing out whatever mistakes he made on the way. It is an inspiring story of resilience and financial freedom. Anyone starting out on real estate will find this helpful."